BROMSGROVE are set to strengthen their squad over the summer as they aim to secure promotion from National Three Midlands next season. 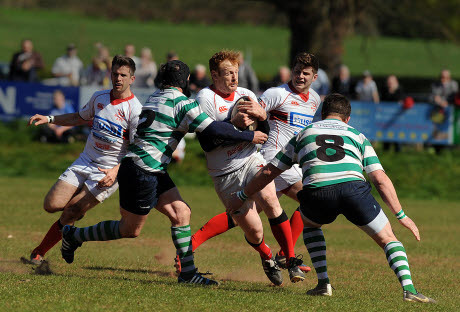 The Finstall Park side finished sixth in the table after their league campaign ended with a 38-22 defeat to champions South Leicester last Saturday. Head coach Dan Protherough said he was pleased with how his side performed this season having had to pick themselves up following relegation from National Two in 2014. But he admitted South have shown them what they need to do to challenge for the title in the 2015/16 campaign, while revealing he was looking to recruit a few new faces. “We weren’t overly disappointed to lose to South Leicester,” Protherough said. “We did not play as well as we have done in the last few weeks, but then again they did not allow us to play that well. “You have to respect the fact they have won the league at a canter and that’s the benchmark we want to be attaining next year. “We have been pretty pleased with the second half of the season as we have scored a lot of good tries and that’s what we want to take forward. However, Protherough said his side will need to improve defensively if they are to maintain a strong promotion push as he expects a number of teams to be in the mix. “The competition always gets harder as it looks like Birmingham and Solihull will be relegated into our league and they are a strong side,” he said. “We will lose DK and Bournville, but we will probably gain another side locally that will be competing at the top of the league.